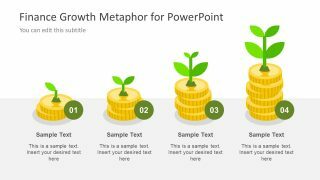 The Finance Growth Metaphor PowerPoint Template is a business presentation the financial analysis of an organization. The template slides contain flat vector PowerPoint shapes of coin bars with small plants growing on top. This plant over coins is the metaphor for financial growth. Although the template is useful in business and financial growth presentations. It is also an incredible design to present the strategies, innovative solutions and entrepreneurship ideas. Further, illustrate the opportunities and business goals with in the gold coin design slide to represent the possible success. Here, the plant on top of coin bars can depict the idea or a project which company is working on. This way, the presenter can demonstrate the profitability of a project in both forecasting and progress reports. 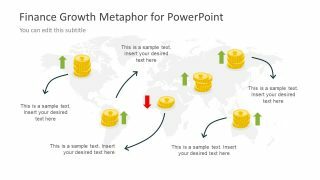 The Finance Growth Metaphor PowerPoint Template has three slides of amazing gold-coin bars designs. The stack of gold coins design is also ideal to display statistical analysis as bar chart graphical diagram. 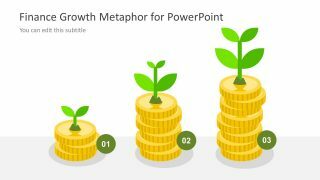 Therefore, the financial projection and growth metaphor PowerPoint has slides of coin bars to demonstrate three and four step presentations. 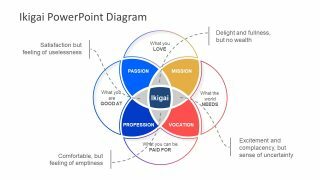 The PowerPoint template of financial metaphors is an impressive template with editing feature like coloring, rescaling and moving the objects. For example, change the colors of coins to show the copper and silver coins as financial clip art. Or, make slides to show more than 4 steps diagram by copying the bars from both slides. 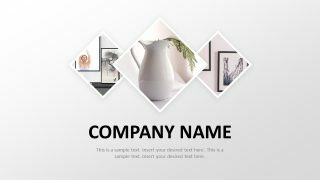 The unique business and financial growth template of PowerPoint has an outstanding slide design of map. With the presentation of map and coins, the company can geographically display the profitable market and rate of sales. The executive audience can view the high performing units of the business to make strategic plan for further opportunities and improvements. This financial growth metaphor PowerPoint has a translucent world map with arrow icons to display increase or decrease finances. Moreover, the placeholders given with the curve direction arrows assists in presenting the useful textual content.